Thy next foe is... A tail trapped within a pail deep within the forest... A shadow that crawls on the walls. This time you want to ride to the south in the direction where the first colossus of them all was located but some time before this turn east (left from your current direction) to find a wide path to the east of where the first colossus was (is?) und cross it. 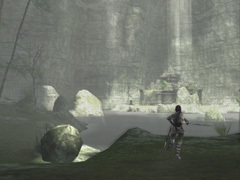 Look at the light reflecting from your sword. The ray points a bit to the left of the path anyways. After coming out of the mountains now find the path forking in front of you, take the path to the right if you want to save, otherwise continue straight to the left. 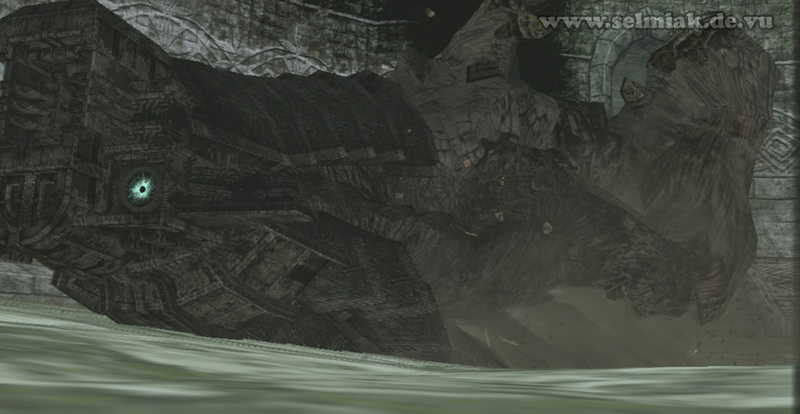 Actually it is useless to save here but I wanted to mention the save shrine at this point in this solution for Colossus #8 of Shadow of the Colossus. To the south-east of the saveshrine (and to the south-east of the way out of the mountains you just came along) is another massive mountain right in front of you now. Over the green plains you will reach an entry into this mountains massive in the middle of the northern side of the new mountainmassive. The entrance is in the shadow (of the mountain, no colossus in sight yet, and this one is rather small anyways) and looks more like a cave than a manmade entrance. 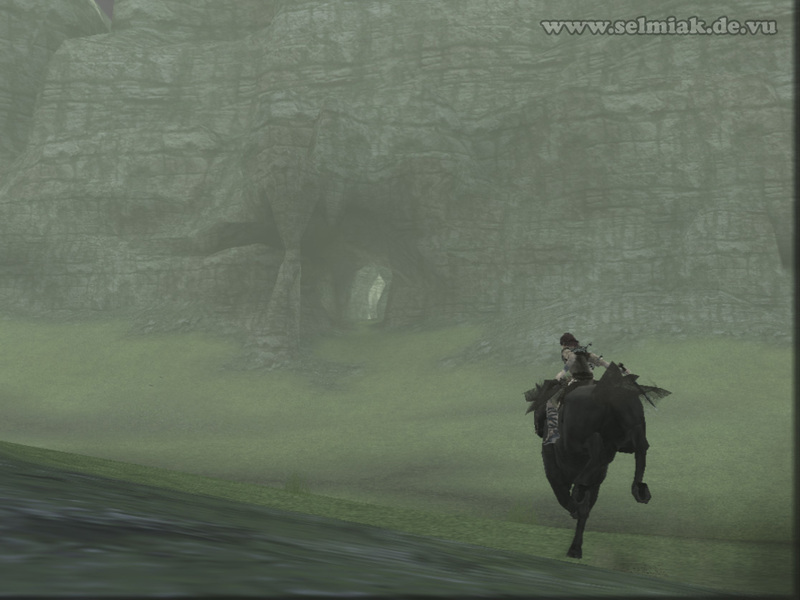 And this is probably because the 8th colossus dug it himself as he is more of an animal than a huge human like figure like colossus #6 that also lived in a cave. Ride along the breathtaking beautiful waterfalls and probably endlessly deep mountain lakes inside the mountain you will reach another lake inside the mountain that is not so deep but easy to reach for you. 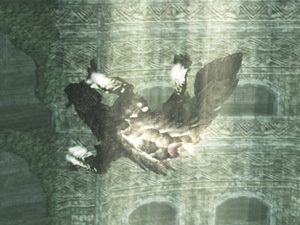 There is a forsaken castle that looks manmade that is also the entrance to the underworld coliseum of the 8th colossus. 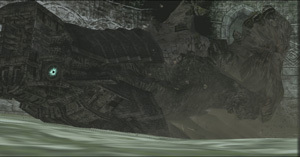 A colossal colossus in a half collapsed coliseum, now this must be interesting, so let's get inside this building and get ready for some climbing action. 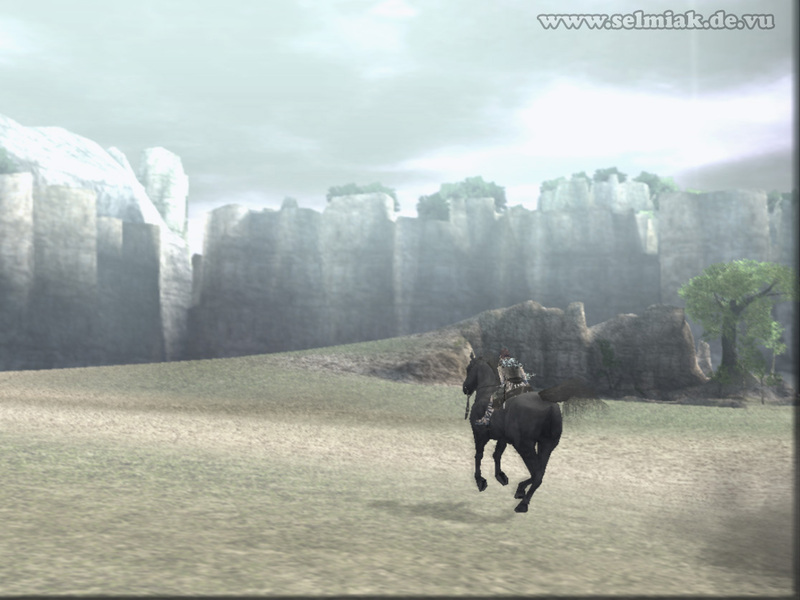 After some climbing exercises on the stones here you can finally enter the half destroyed coliseum of the 8th colossus. And this guy is in no way the 8th world wonder but more of an annoying mean lizard colossus, and now you have to defeat him. Get down one story and take a look around. I mean get used to the architecture of this huge coliseum , get a feel for the height if it, remember where the stairs are and where there are missing walls throughout the stories and then look down. Down here is your enemy. Attract his attention by hurting the eighth by shooting an arrow down to him. 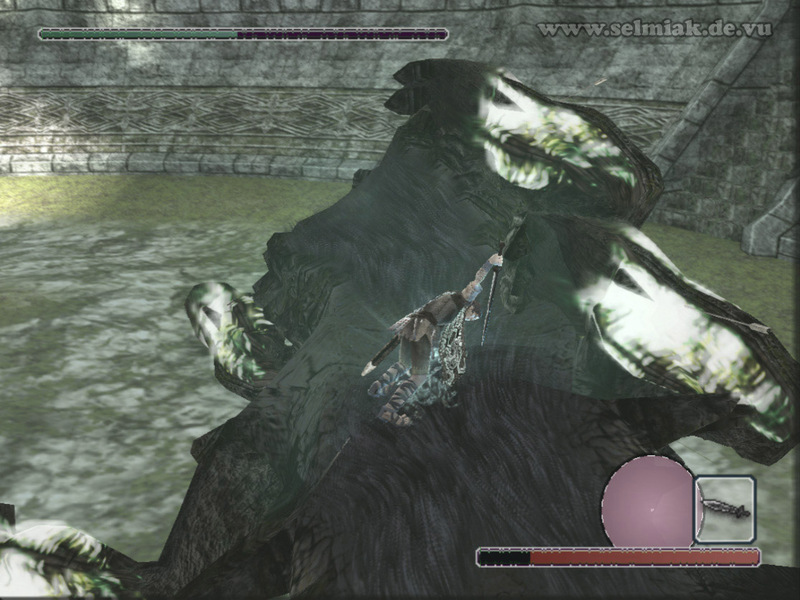 Now you will notice that this colossus is a pretty fast climber, he will be up on your height in a matter of seconds. And because it is not very relaxing to stand here next to such a stinky old lizard and smell his thousand years old breath you should run down all the stairs into the fighting arena in the middle of the coliseum . As you see, the 8th colossus stays up there on the wall. 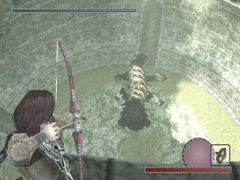 Now use bow and arrow to shoot an arrow up to him while he is still high up on the wall. Aim for one of his brightly lit legs. While he screams in agony and stops moving for a moment you see and use your chance and shoot another glowing leg you can freely chose and he will fall down to you into the arena. 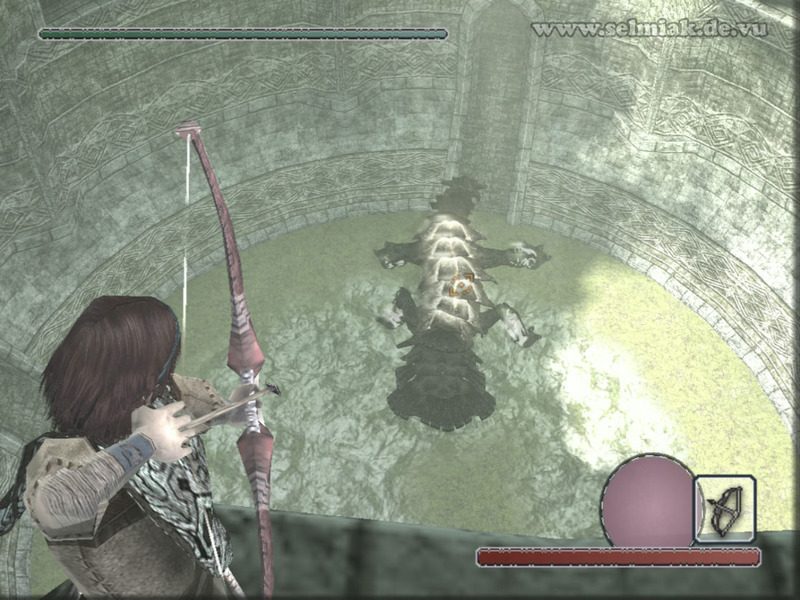 Weakened by the fall the poor lizard colossus stays lying on his back and shows his weak point on his stomach. Climb onto him over his tail and run along his belly to the first of the two ornaments and blow your sword into his glowing ornament. Once you drained his health down to 50% he will regain his strengths and shake around and shake you off of him. Now he is more aggressive than before. So run up to the nearly topmost story and lure the 8th colossus up by shooting him with an arrow. But be careful this time he spits at you with his electric drool, which is no good for you if you are standing next to it or even right in the middle of the sparkling brown fog. And the worst thing is he is after you really fast. It is quite useless to run down and shoot him from down here as he will be down there too really fast. So hide somewhere high up in the coliseum and check what's going on. Once you know here the old lizard is shoot an arrow to his leg (not his knee) and if you are fast enough of course shoot another arrow to a second leg to make him fall once again. 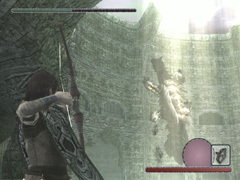 If you miss the second arrow run as fast as you can to another hole in the wall in your story as the colossus will now shoot his electric drool to where the arrow just came from. If you are in a good position to shoot him now why not just do it and get your double hit to make the 8th colossus fall down again. 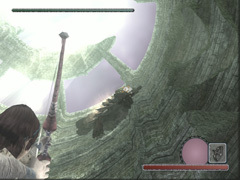 In case you're lucky and got 2 good hits and the eighth colossus dropped down to the ground you have to be really fast coming down because otherwise the colossus will just stand up again and continue where he stopped, and that might be hunting you down with his electric drool. 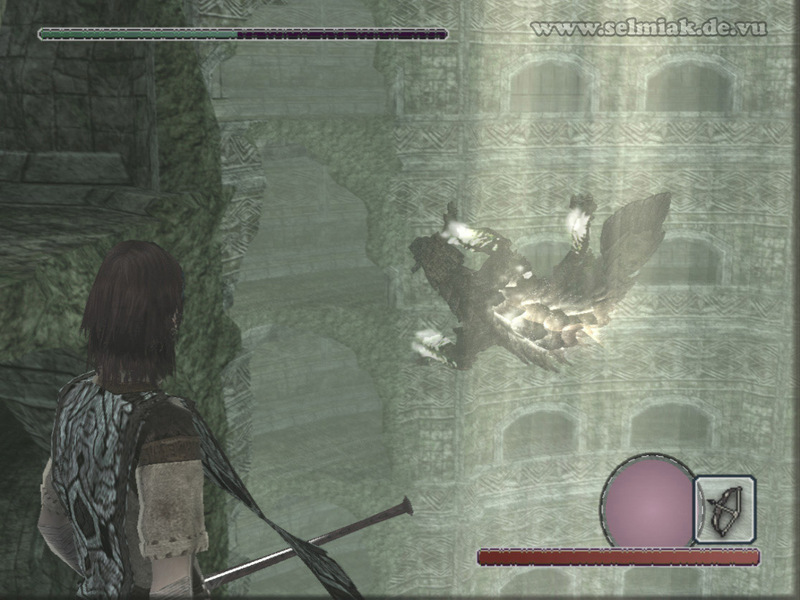 But because you should be standing at a hole in the wall just jump down, Wander will survive this, or well, he has to survive this. To be on the save side you can stop jumping down halfway and steer into another floor and land there in pain before jumping down the rest of the way. Once you are down you climb on the colossus over the tail again and blow your sword into his last ornament until he is history.